Where did the 234 lbs. of food per year per person living at or below the poverty line formula come from? The 234 lbs. formula was developed in 1989 based on research conducted in Michigan by the state Food Bank Council. The formula was subsequently adopted by many organizations across the country because no more general alternative existed. In the year 2000, Dr. John Cook of Boston University did an evaluation of America’s hunger problem for the Bread for the World Institute’s annual report, where he suggested a total dollar figure. If you divide Dr. Cook’s figure by the average cost of food and then by the number of people living at or below the poverty line in the U.S. (both as of the time the report was released) you get an estimated need of about 236 lbs. per person living at or below the poverty line/year, which has generally been interpreted as close enough to support the 234 lbs.-based formula. A similar calculation performed with Feeding America’s Map the Meal Gap data for 2012 provides another reinforcing datapoint, yielding an estimated need of 228.6 lbs. per person in poverty. As of this writing, the 234 lbs. formula remains in broad use. It is not perfect, but the evidence suggests that it is probably not terribly far off of the mark. At the least, the 234 lbs. formula gives communities a starting point in trying to grasp how much food aid might be needed in their area. Where did the rest of the information in this guide come from? Much of it is derived (and occasionally copied with permission) from a publication titled Charity Food Programs Than Can End Hunger in America, which was produced by Second Harvest Gleaners Food Bank of West Michigan (now Feeding America West Michigan Food Bank) after an intensive study of the charity food system that they conducted in partnership with researchers from Michigan State University during the mid 1990s. The remainder is based primarily on interviews with professionals working in the charity food distribution system, and on firsthand observation of the various models of food procurement and distribution at work. How do I find my local Food Bank? The easiest way to find your local Food Bank is to visit the Feeding America website at http://www.feedingamerica.org. 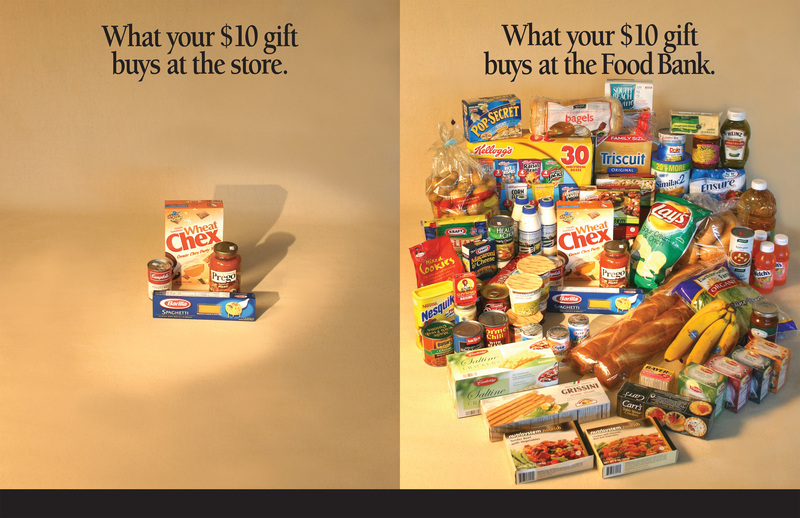 Put together a poster or a display comparing $10 of store-bought food to $10 of Food Bank food. The comparison is invariably impressive. If you want a portable display, drop it down to $1 vs. $1, as $10.00 of Food Bank food is generally too much to carry. Invite a group that might have otherwise done a food drive to collect money instead, and then have them accompany you to pick out food at your local Food Bank. In churches that have traditionally had children carry food up to the altar, try asking people to wash out empty cans and put checks inside. This preserves the traditional image and ritual of food and feeding, while greatly increasing effectiveness. How much food should clients receive? While you should always be willing to adjust for special circumstances, multiplying (4 lbs.) x (number of people in the client’s household) x (the number of days worth of food they think they need from this visit) will usually give you a pretty reasonable number. For example, a client with three people in their household, needing food for four days, should probably receive about 4 x 3 x 4 = 48 lbs. of food. Client choice pantries may want to provide scales so that clients can weigh their food as they go along. If you do not do this, many people will not take enough, and you will have to send them back for more. How often should clients be allowed to seek help? In general, as often as they need it. Easy as it can be to become paranoid, it is far more likely that your frequently appearing client is coping with an unexpected situation or picking up food for a needy neighbor rather than trying to sell a mixed lot of groceries out on the street. You might politely inquire if it genuinely seems like something strange is going on, but unless the need in your area is so severe that you are facing significant shortages even while getting upwards of 75% of your food from the local Food Bank, there is no good reason to routinely turn people away just because they have been helped recently. If clients are allowed to choose their own food without clear guidelines, won’t they make bad/unhealthy choices? Can I contact you if I have further questions? Certainly! Feel free to send me an e-mail at jethomas@npiinc.org.